The drive from the Jurassic coast back to Birmingham was always going to require a stopover. It’s not like the journey there, when the anticipation of the sea breeze takes over and five hours in rush hour traffic doesn’t seem too bad an idea. The trip back to reality is a gruel where work and bills and air pollution await. We needed somewhere that isn’t a Welcome Break to recharge our internal batteries. To take stock of reality. To bemoan that nauseating fool in the office who will ruin the holiday mood first thing Monday morning. 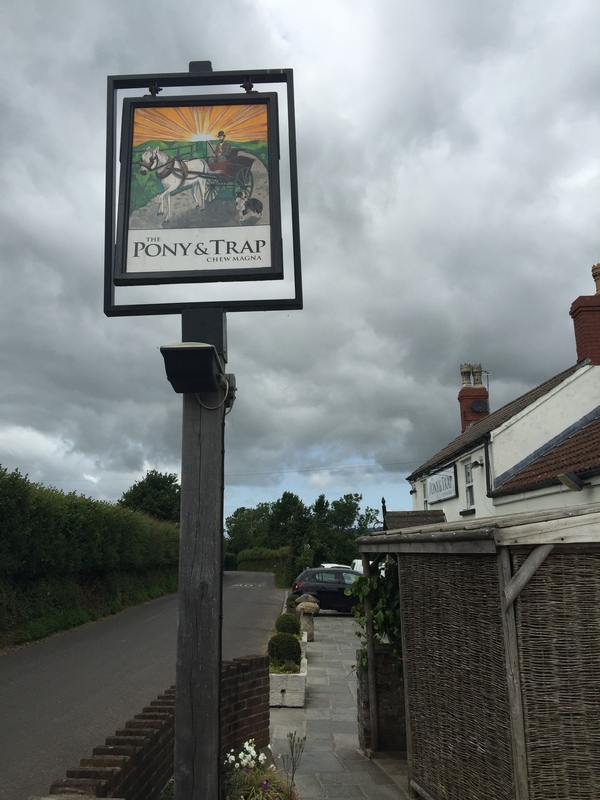 The Pony and Trap was our choice. Located nine miles away from Bristol in the quaint Chew Magna, it would split our journey in half. The food also promised much; chef Josh Eggerton is a Gordon Ramsay scholar with the pub holding a Michelin star and current number two ranking on the list of UK gastropubs. Inside is a mish-mash of woods, pale green panelling and off white walls. There is a dining area overlooking the pastures of Somerset, and a jukebox that ventured from Radiohead to Aaliyah via Andy Williams. We waited a length of time to order that would have raised eyebrows in the city, though here in the countryside it felt fine. It is impossible to be pissed off with service whilst “Music To Watch Girls By” plays in the background. Despite its star, there is no amouse bouche, no fiddly canapés, and no bread offered on this sunny Sunday afternoon. Its straight into the starter of mozerella and heritage tomatoes with basil. The salad is the first indication of what is to come; the tomatoes have a firm texture and flavour seldom found in this country. 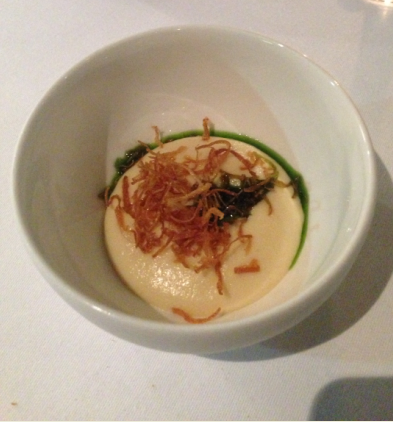 The basil as a dotted puree around the edge of the plate and also fragrant leaves. Its late June on a plate – as seasonal as Only Fools and Horses on Christmas Day. 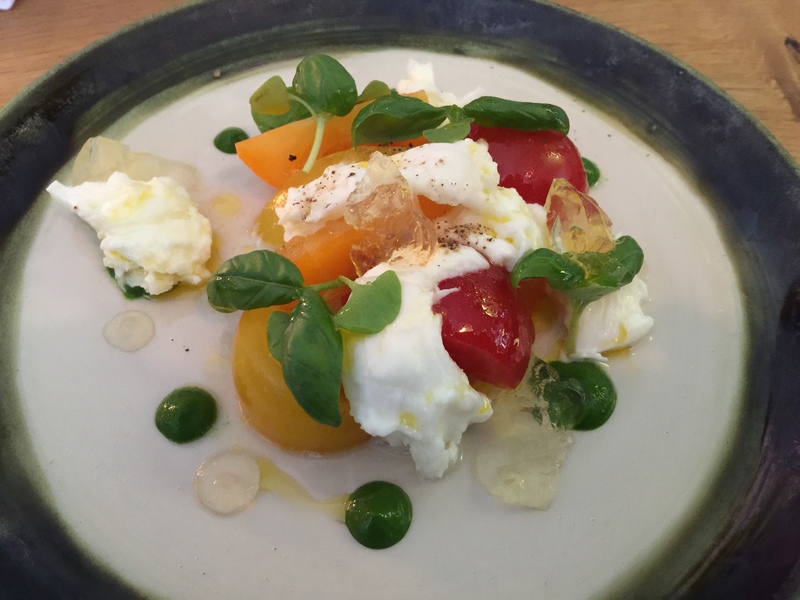 Only a jelly from tomato consommé felt misplaced, with the flavour muted and the texture unwarranted with the luscious mozzarella already providing the creamy mouth-feel. The ethos here is “Field to Fork”, which was in full effect on the main course. 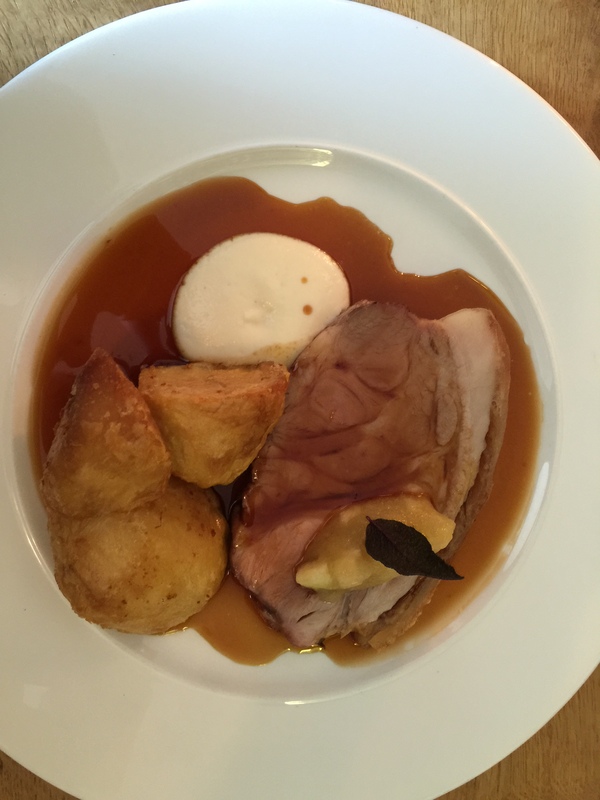 A slab of organic pork with a thick ribbon of fat, some roast potatoes, apple sauce, a cauliflower puree and gravy from the roasting juices. It was an imposing plate for its simplicity; the pork, amongst some of the best I have ever eaten, blushing pink and tender, with a crackling full of crunch and salt. 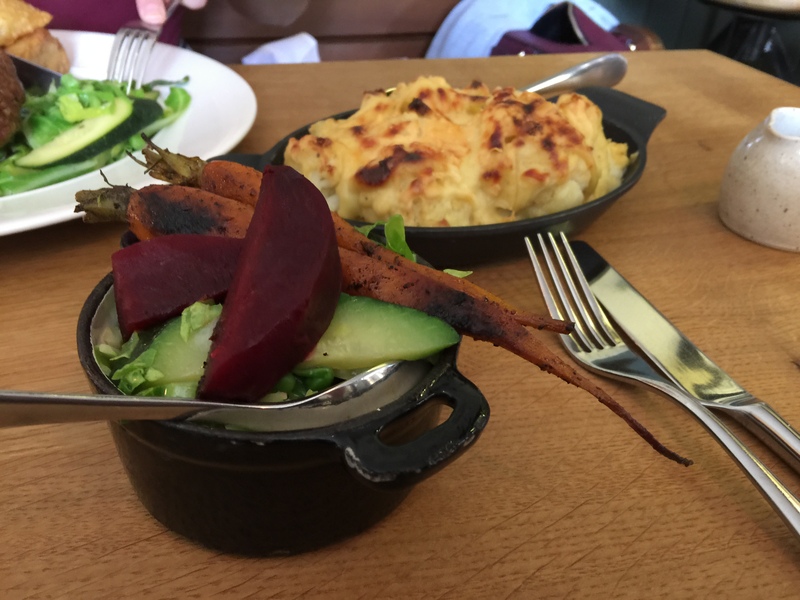 On the side were a small pot of more veg and a substantial cauliflower and leek cheese worthy of a paragraph of its own. The whole heads of the flower full of texture and a cheese sauce with the faint suggestion of mustard. My girlfriend, who was tucking into a meat-free plate, commented that nothing fancy had been done to any of the veg to highlight the freshness and quality of the ingredients. I agreed with everything she said. 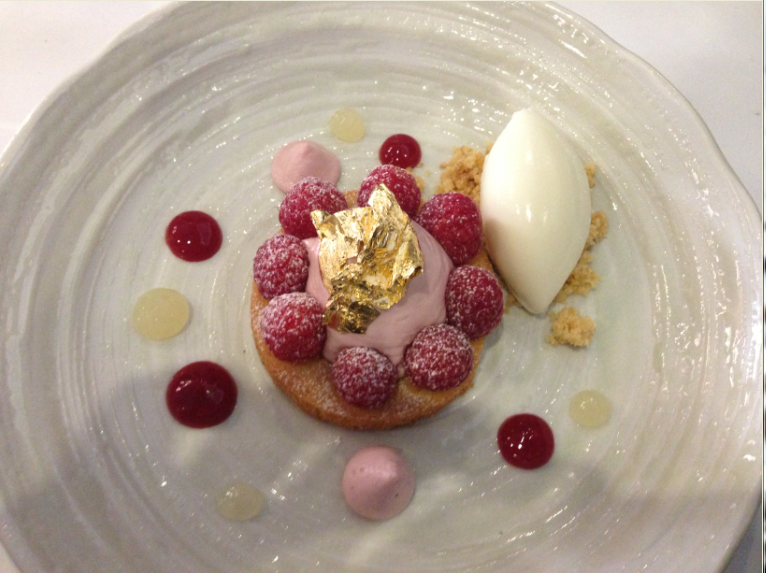 Desserts maintained the high standards. 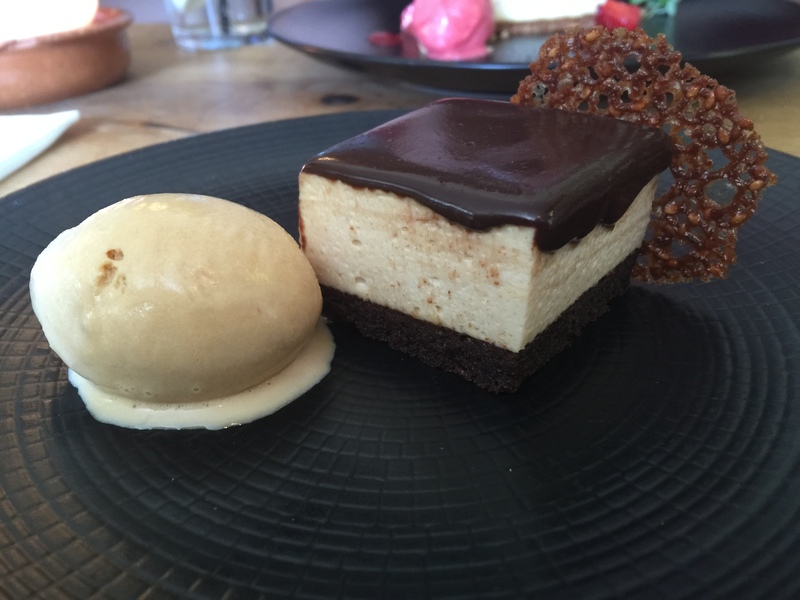 A peanut mousse with a chocolate brownie-esque base was overshadowed by a salted caramel ice cream that had me scraping the textured black plate to a sharp shrill. 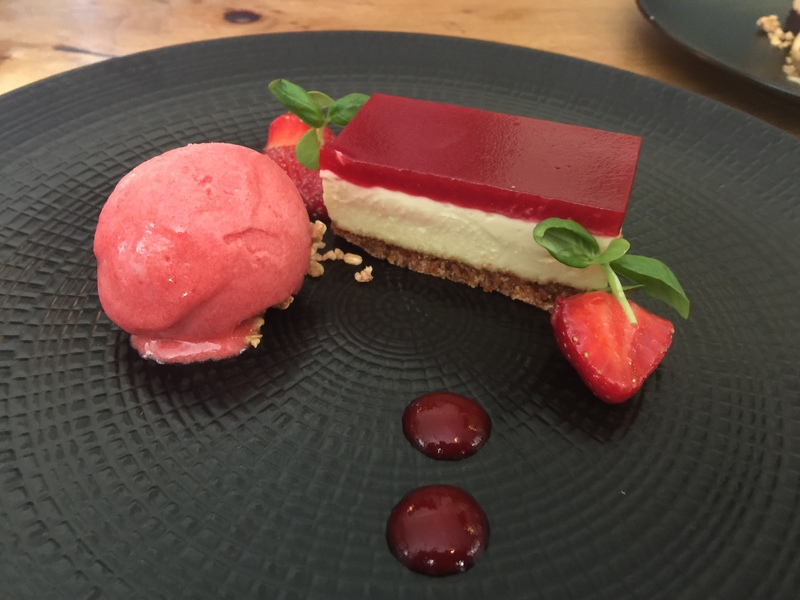 Better still was a strawberry and white chocolate cheesecake of ethereal lightness with a strawberry sorbet. It was a day at Wimbledon a week early, only without the Pimms or screams of Come On Tim whilst Andy Murray plays. Its impossible to dislike The Pony and Trap. Even with the gaps between courses and the winding paths between tables, its an immensely likeable place. The larder on their doorstep serves them well and they utilise it with skill and respect. The bill placed on the table seems remarkably cheap for what we ate. I pay it and meander to the toilet to see they are doing an offal evening in November. Bits of animal organs seems a good enough reason to return on its own steam. We’ll be back and next time it wont be out of convenience. Of the four starred restaurants in Birmingham, it was Turners that kept on alluding me, despite the fact that I walk past it weekly on the way from my home to my local boozer. I really don’t know why. Perhaps its location always pitted it directly against Simpsons, who’s Georgian grandeur a mile away always won against the bijou building a couple of doors away from Iceland. After all, nobody wants to be that close to a potential encounter with Kerry Katona or Stacey Solomon. Within the confides of the tiny, dimly lit space, is the cooking of Richard Turner, who’s seemingly modern approach to cuisine is direct juxtaposition to the staunch French approach to service. I asked for the wine list which took twenty minutes to arrive. The first nibbles came some fifteen minutes after that. They were okay. 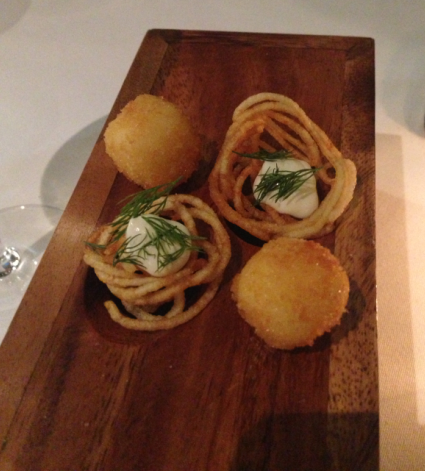 There was some toast with truffle, a parmesan donut and a deep fried beet top with cep powder. All capably eaten given how hungry we were at this point. 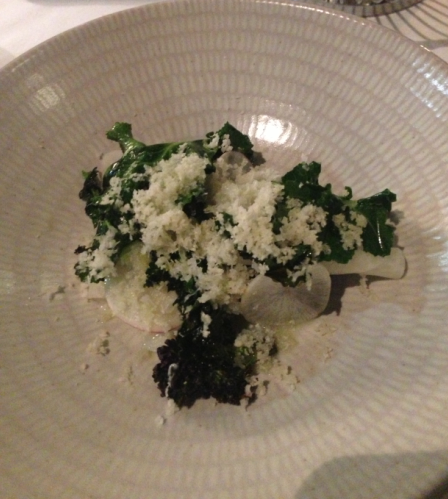 There was a starter of salad of radish and cauliflower with kohlrabi juice that took me back to the wonders of L’enclume a year back, the flavours clean and accurate, with nice salty notes from grated parmesan. This came swiftly after a lesson in texture from an amouse of stinking bishop, potato and parsley, seemingly straight out of the kitchen of Sat Bains, even if the cheesy mousse didn’t sit too well with the parsley extraction for my liking. Watching truffle being sliced tableside is a joy that will never grow tired for me. 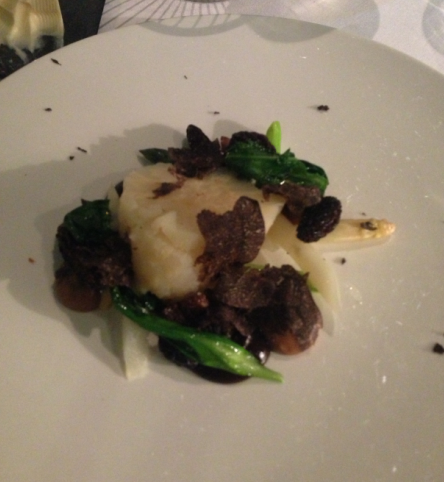 Here lashings of it covered a salt baked celeriac, again served tableside, with some morels and asparagus. 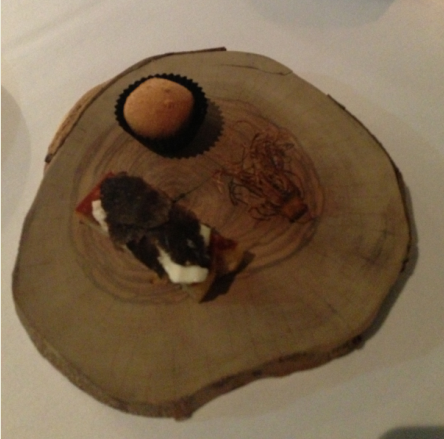 Sadly, it was all ceremony and little flavour, as the truffles lacked depth of character that you would expect. The celeriac proved any root vegetable tastes better when encrusted in salt and baked. 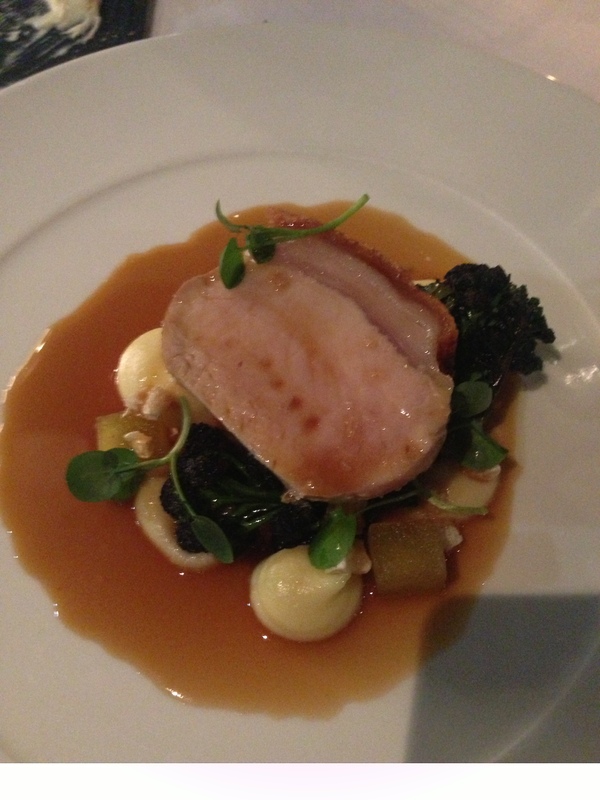 There was a loin of pork betrayed of any real heat, atop of a piece of belly, with some lovely tender stem broccoli, silky mash potato and cubes of roasted apple. All very textbook and I’m sure the chef intended it to be like this, but the texture of meat that has been sous-vide only feels wrong to me – especially so with pork. 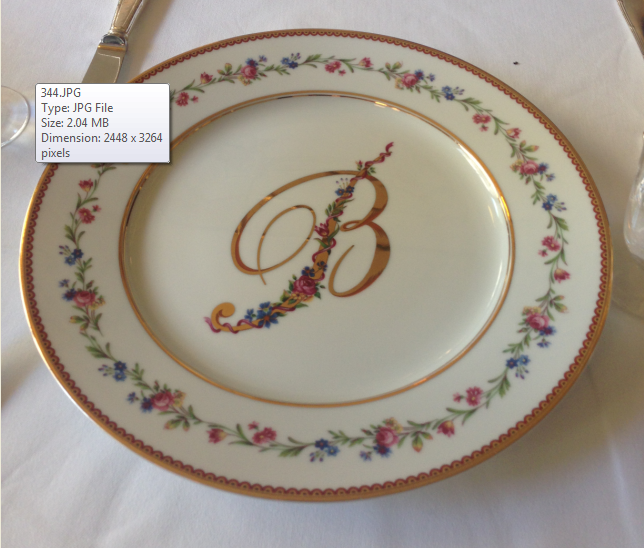 That said, the plate came nicely together in an inoffensive way, much in the same way brown curtains are matched to magnolia painted walls. 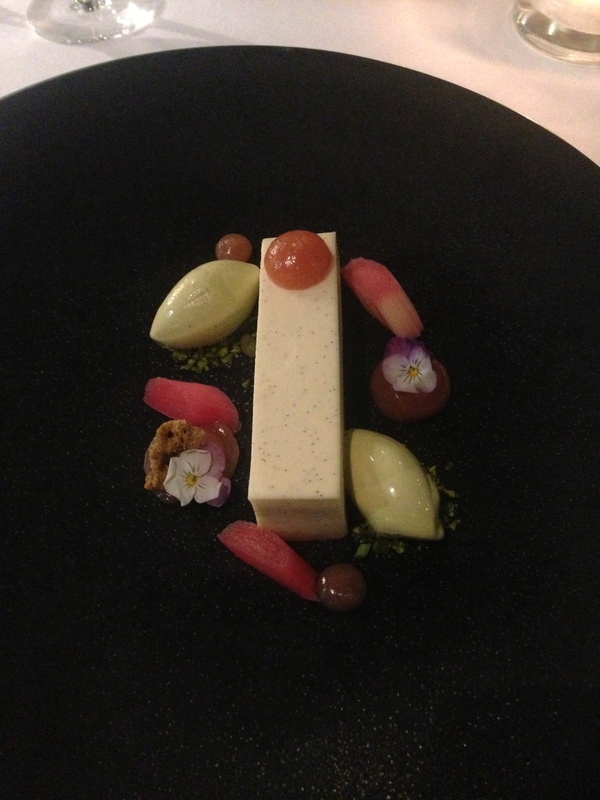 Dessert was a vanilla parfait, with pistachio ice-cream and various bits of rhubarb. Rhubarb and custard, if you like. It was a stunning piece of cooking, both skilful and witty. Classical with a modern touch. It was also the first time throughout the two hours that I felt excited by something I ate. Like watching Basic Instinct to find the interview scene had been moved to the end. I can tell you with certainty that Turners is my least favourite of the Michelin starred restaurants in Birmingham. I can also say fairly confidently that its possibly my least favourite of any restaurant I have eaten in to be graced with a star, or stars. Food is subjective. Everyone has an opinion. The restaurant was full when I was there and that proves that people will pay good money to eat food which is technically flawless. Everything I ate was served as intended by the chef. It just didn’t excite me. Michelin By Numbers. I genuinely had no idea of the chefs cooking style, if he has one at all – sometimes like Turner himself was referencing the restaurants he had dined in. I’m glad I went to Turners to satisfy my curiosity. It means I can now keep on walking past it. 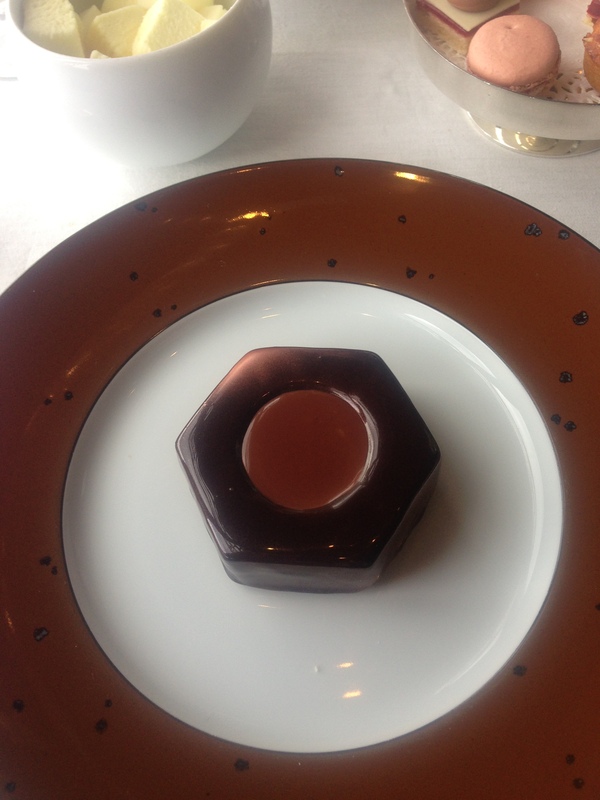 Let’s start with an admission; from the moment my dessert turned up, when the waiter plonked two bottles of Armagnac on to the table and told me to help myself, Benoit was on to a winner. Quickly I sank in to a haze of French Brandy where everything made sense. The wood panelled and mirrored walls became less cold. The waiters, with their matching shirts and aprons, found a sudden charm as they buzzed in-between the tightly packed tables. 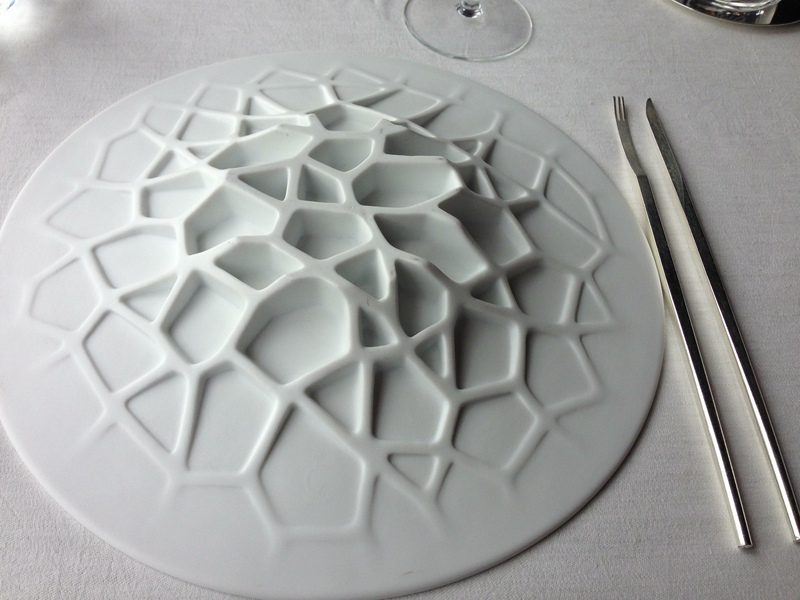 Alain Ducasse must have been sloshed when he purchased the most famous bistro in Paris. And who can blame him, it’s a great place for getting sloshed. 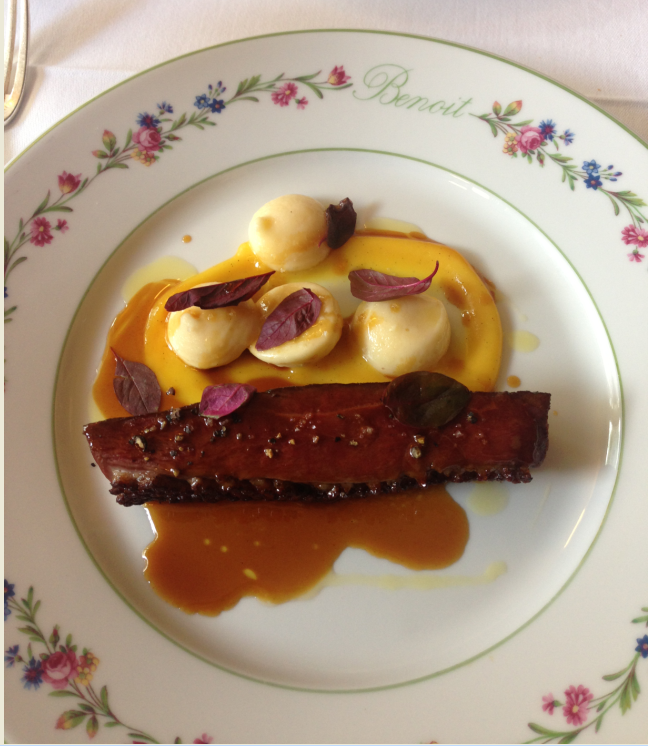 Apparently, little has changed at Benoit since it opened in 1912. They still serve the same classic bistro food to the well-heeled of Paris, though recent years has seen the addition of a Michelin star and the world’s most celebrated chef as owner. 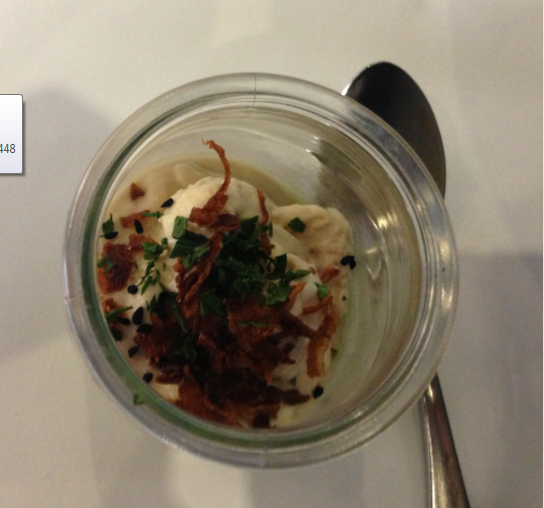 It makes for an interesting juxtaposition of styles typified by the starter of vichyssoise. 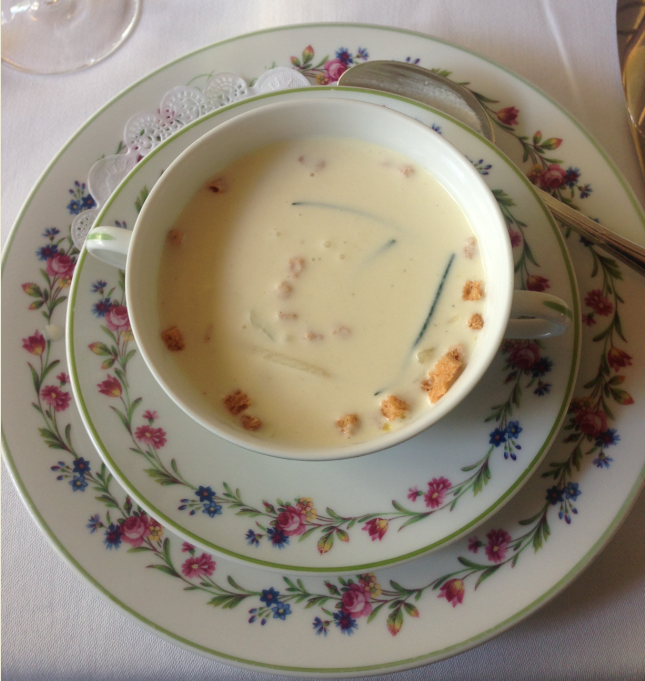 Here the silky cold potato and leek soup is poured tableside into a bowl with finely julienned vegetables and croutons nestled at the bottom. It’s refreshing and elegant. Boldly seasoned to the point where some would say its salty. I say it’s delicious. 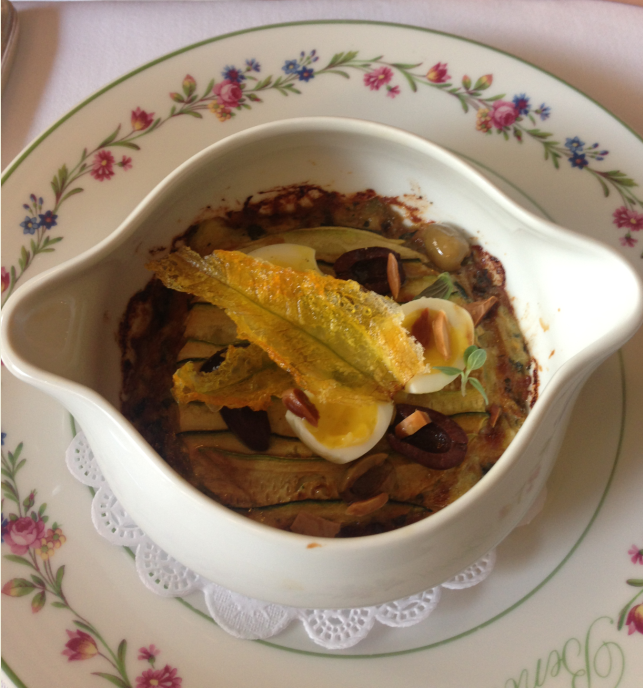 There was more vegetable wizardry with cookpot – a signature dish of Ducasse – with accurately cooked ribbons of spring greens, olives and quails eggs producing a light yet substantial vegetarian main. Duck, in my opinion, is a meat that is best served blushing pink like lamb, whereas here the length of breast was crimson red, with each knife entry yielding a little blood into the perfectly made bigarade sauce. It was rare in the way that I like my beef and the dish suffered for it. The accompanying gnocchi were a work of art; little pillows of airy mashed potato that almost made up for the undercooked protein. And the aforementioned dessert? 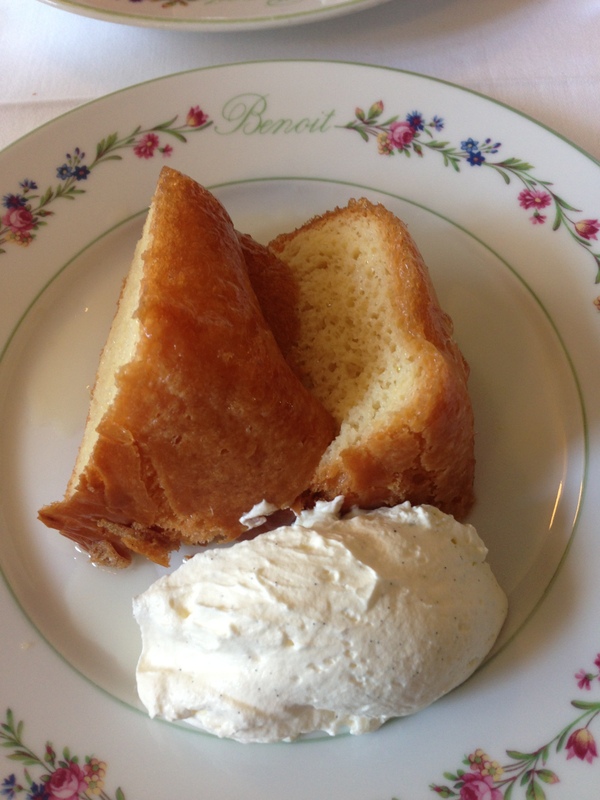 It was a savarin, the baba’s heavier sibling, with lashings of vanilla heavy chantilly and doused in the brandy. 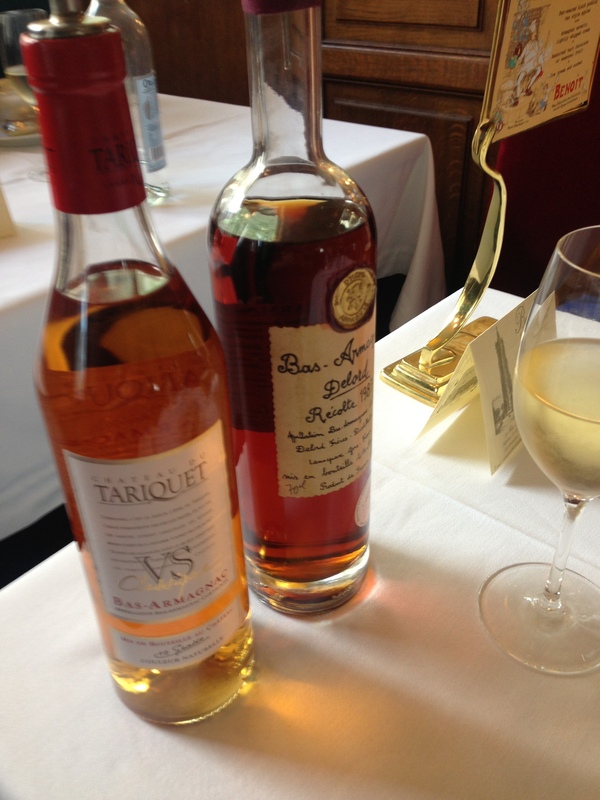 I asked which of the two Armagnac’s I should go for, the waiter said both. So both it was. It was a glorious thing that appealed to both my sweet tooth and alcoholic tendencies. My blood sugar levels raised, my liver winced and the rest of my body called out for more. There were some tarts as the other option. I recall them being fine, though hardly memorable. All of this made for an interesting lunch, which I guess is the point to Benoit – they genuinely want you to eat, drink, and be merry. It’s an absorbing and indulgent experience that never takes itself too seriously. Both the service and portions are generous, which they should be, as neither the food nor wine comes cheap. Though as we sauntered off into the Parisian sunlight with a light head and heavy stomach, there was no doubt it was worth the money and inevitable headache the following morning. 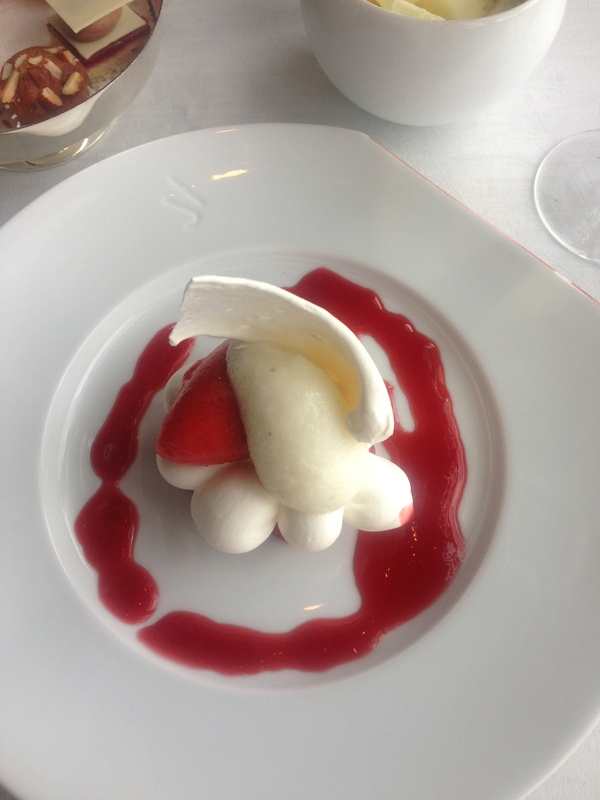 The build up to eating at Le Jules Verne is as important as the meal itself. 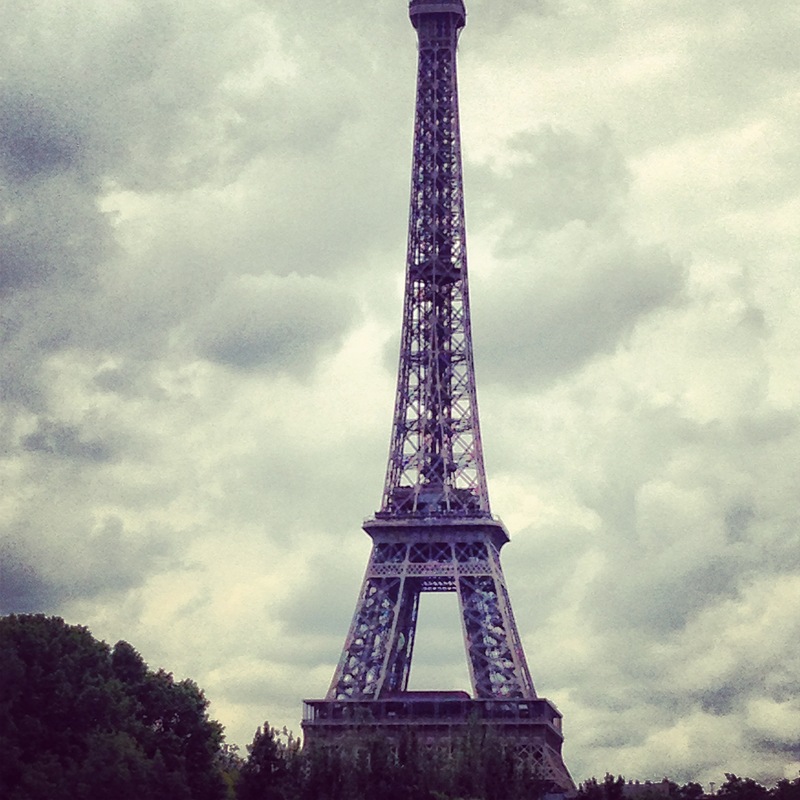 The Eiffel Tower looms proudly over Paris, with the middle section, some 123 metres up, visible from every street corner. From the moment you wake up, to the time you enter through the metal detector, in to the private elevator, and up it to airy dining room with its angular lines, it’s there, as unavoidable and imposing as the army of servers that wait on the slightest of moves. And what of the food itself? Does it really matter? The reality is that the three month waiting list to get a decent table here has very little to do with Alain Ducasse’s haute cuisine. The endless stream of camera phones snapping into the distance proves that they could serve the leftovers from a kebab shop here and folk would still pay a fortune for the view. That view though, it is very impressive. And credit must go to the French for this for putting one of the most celebrated chefs of all time here and in turn, turning it in to a destination restaurant itself. Put this tower in London and watch them stick a Jamie’s Italian in to feed the hordes with the “most pucka asparagus eva”, whilst here, with no such bravado, was a “plate of vegetables” featuring asparagus steamed and also as a mousse, peas, and courgettes. The greens were off-set by a lemon puree and dehydrated orange slices can added just the right amount of acidity. In lesser hands this could have been instantly forgettable, though, here, it was a vibrant remainder of the bounty that late spring can offer. 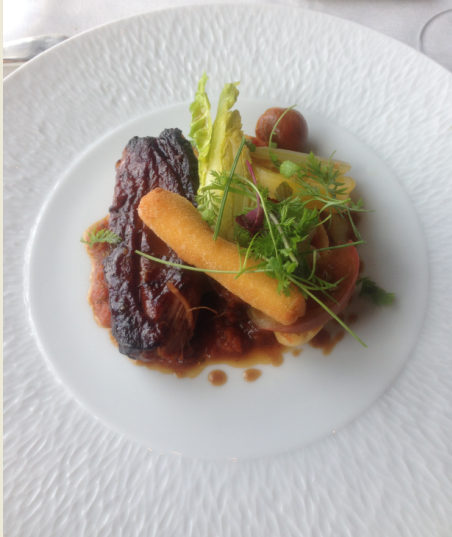 There was more success with a pressed piece of veal shank, its meat dense and caramelised from an age in the oven. There was more perfectly judged acidity – this time from the sort of tomatoes we can only dream of in England. 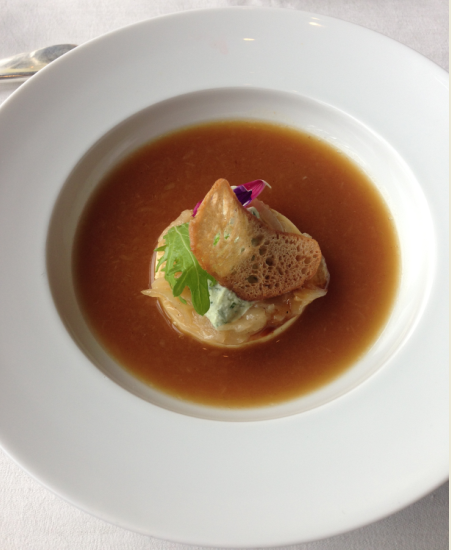 The previous starter of French onion soup saw a beef stock poured over a set onion mouse to create a starter equally comforting and elegant. Desserts of strawberry and lime vacherin and a chocolate/nut tower were every bit as decadent as you would expect from a Ducasse kitchen. Both of these could easily have graced one of his three starred establishments. Still, despite this, Le Jules Verne is far from the perfect dining destination. Artichoke barigoule failed at the reinterpretation that the onion soup had been so successful at by being under seasoned and a pre-starter of beef jelly with raw vegetables and carrot foam was every bit as bad as it sounds. And then there is the price, for which there is no really no ignoring. 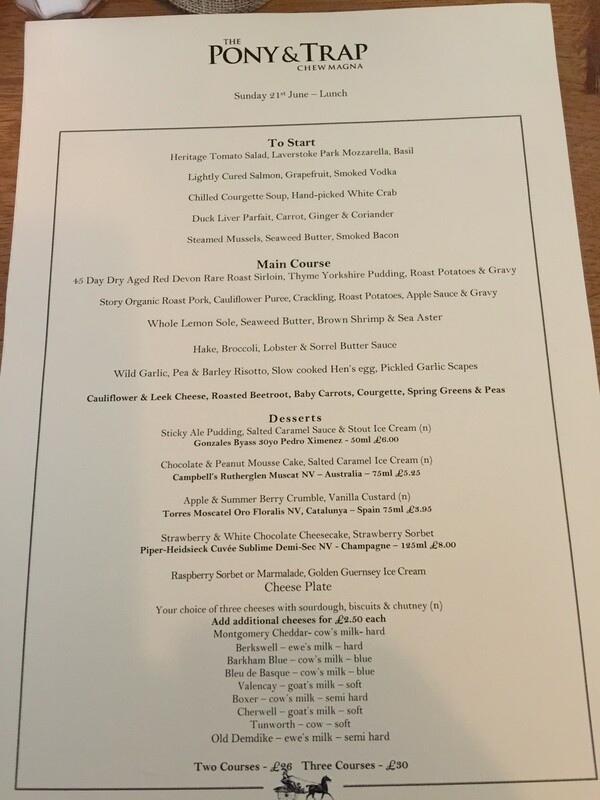 Our lunch, three courses with a bottle of Sancerre from the lower end of the list, came to nearly three hundred English pounds. Go for dinner and you’re looking at double that. Some may call it a rip-off and to those I would be inclined to agree, after all it is hard to justify the experience of paying ten euro for a bottle of Evian water. 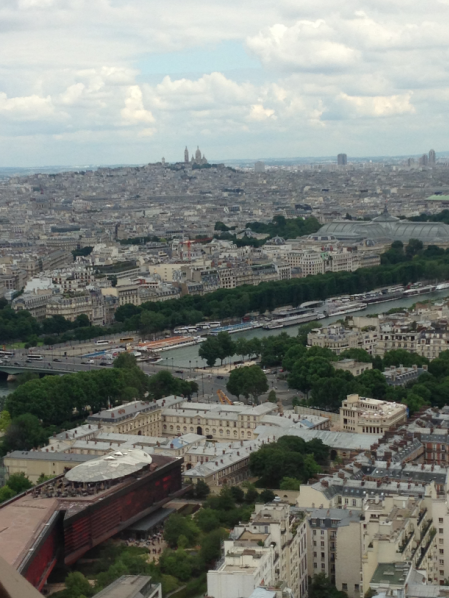 In hindsight we probably should have spent that money on lunch at a flawless three star with a view of the Eiffel, rather than a one star restaurant in a floorless tower overlooking the roof of one of the cities many three star restaurants. But hey, we’re tourists that just jumped the queue and for an hour or so it felt amazing. You can’t put a price on that, can you? If you can, you bet your bottom Euro it’s going to be a big one. If I were to base my opinion on Simpsons purely by the service provided in the first half of the meal it would be a shocker. They failed to account for the two vegetarians I had mentioned when booking, messed up the wine order, brought starters to the table with no real idea who they were for and gave a lamb main to a friend that had ordered hake. I was fuming on the inside, glad that we had gone with mates instead of subjecting this to the mother-in-law. From there a nice chap called Nick took over, apologised sincerely in the correct manner and all was right in the world. Fortunately for them, it was hard to remember the dodgy start once the food started flowing. Every single nugget offered was glorious. From the amouse of parsley pannacotta with crispy onions and bacon foam, every ingredient was pronounced and yet harmonious with its plates partners. 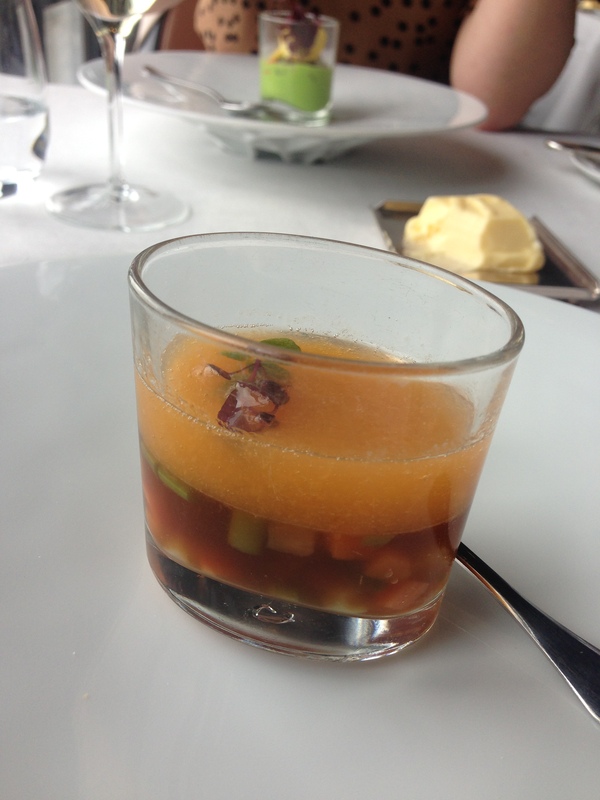 A duck leg starter had been given the right amount of time and heat needed to fall apart on the fork, came with perfectly crisp skin and was paired with peach, mouli and sesame. The whole plate having just enough acidity to balance the rich meat. 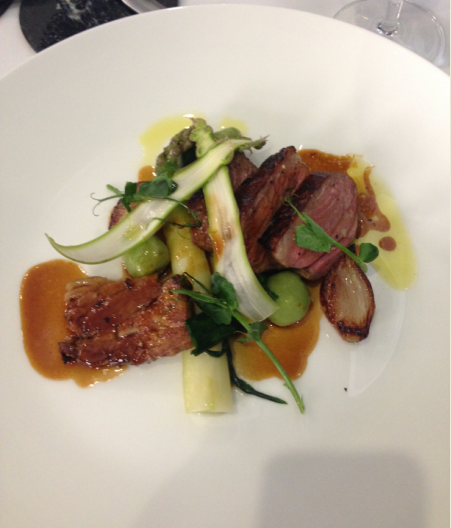 Lamb for main, a meat which so many establishments make a mockery of, was perfect. 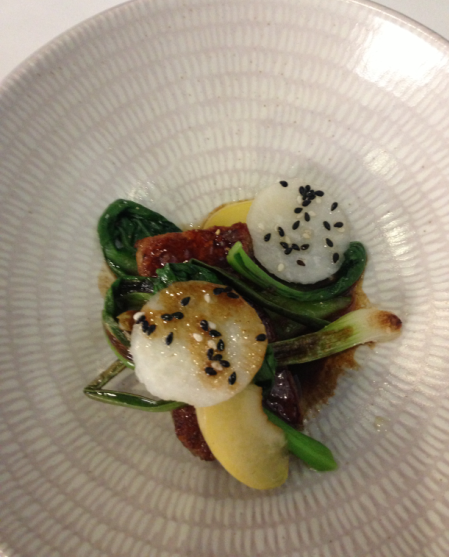 Here the pink rump and caramalised scrag were served with wild garlic gnocchi, asparagus and grilled onions. It was spring on a plate personified, held tightly with a deep sauce made from the lamb bones that was mopped up with the last of the bread and then with my finger once that had gone. 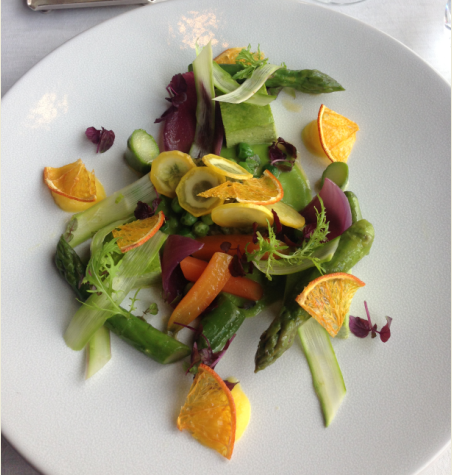 Desserts, so often now a further collection of vegetables and greenery, were equally classical and impressive. 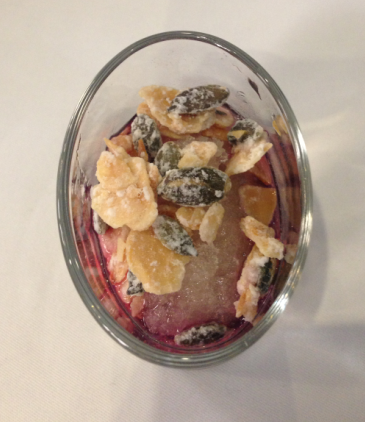 There was a pre-dessert of cassis granita that sat atop of a vodka jelly with frozen seeds, followed a raspberry mousse and lemon sherbet sorbet elevated by the most buttery of sable biscuits. Take note, fellow foragers, this is how sweet courses should be made. This was absolutely the best meal I have had to date at Simpsons and was, in my humble opinion, every bit as good as some of the two star restaurants I have eaten in over the last year. 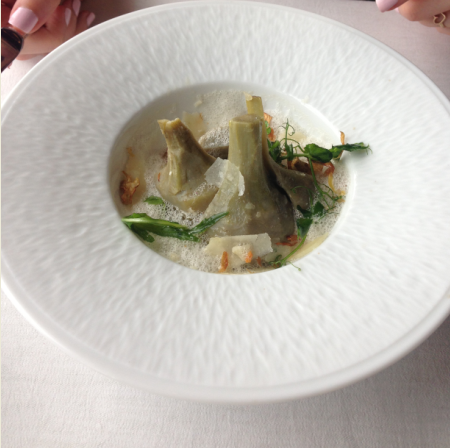 There was a careful editing process to each dish, with every ingredient fully deserving its place on the plate. Sure, there were service issues that need tweaking, but these were handled with the professionalism expected. Make no doubt about it, this is the best cooking in a city that a has a food reputation growing by the day.